A six-week meal plan for those who have GERD / Acid Reflux. Finally! A diet specifically for people with GERD / Acid Reflux! Finding delicious food that won’t cause acid reflux flare-ups can be a challenge. With The Dr. Gourmet Diet Plan for People with GERD / Acid Reflux you can eat healthy, maintain a healthy weight, and eat great food without the pain of reflux. Over 50 GERD-friendly recipes, including a GERD-Friendly Tomato Sauce! Eating when you have GERD / Acid Reflux CAN be delicious, healthy and varied! 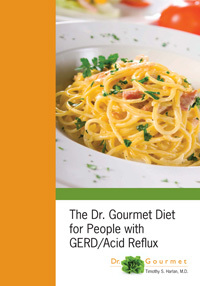 Download The Dr. Gourmet Diet for People with GERD / Acid Reflux today!